To Kollbjørg on the "Ships starting with K" page. Tonnage: 8259 gt, 12 670 tdwt. Built by Eriksbergs Mekaniske Verkstads A/B, Gothenburg, Sweden in 1937. Captain (when sunk): Edvin Apall-Olsen (Vav also had a captain by this last name). Previous captain, Alfred Edvardsen? See narrative below. Follow the convoy links provided for more information on each (please be aware that some of the external convoys are incomplete, as are some of my HX convoys; the latter will be updated). Oct. 2 Liverpool   ON 22 For Halifax. Page 2 gives arrival Oct. 17. Nov. 30 Milford Haven   ON 42 For Providence R.I.
Febr. 8 Liverpool   ON 65 For Corpus Christi. Febr. 19 Dispersed from ON 65 St Rose March 5 Independent See also Page 2 and narrative blow. *Date should be June 26 and voyage belongs further down in the record - inserted there. June 20 Hampton Roads   KS 512 Detached June 26. *Voyage inserted from above, and date corrected. Aug. 19 New York City Halifax Aug. 22 BX 34 NYC/Cape Cod Bay/Halifax. Oct. 4 Gitmo Curacao Oct. 7 GAT 11 Gitmo to Curacao. Nov. 19 New York City Clyde Dec. 4 HX 216 See also narrative below. According to Page 1 of the archive documents, Kollbjørg was in Santos when the Germans invaded Norway on Apr. 9-1940. She left that day for Port Stanley. Her 1941 voyages also start on this document, and it'll be noticed that she spent quite a long time in New York that year. She had arrived there from Trinidad on June 21 and departure is given as Aug. 30, when she proceeded to Halifax in order to join Convoy HX 149 to the U.K. on Sept. 10. The following month, she's listed as bound for Halifax in station 33 of the westbound North Atlantic Convoy ON 22*, which left Liverpool on Oct. 2 and dispersed on the 15th, Kollbjørg arriving Halifax on Oct. 17 - her voyages in this period are shown on Page 2. Eglantine is named among the escorts for this convoy; see ON convoy escorts. Kollbjørg headed back to the U.K. on Oct. 22 with Convoy HX 156, Eglantine is again named among the escorts, as is Montbretia. Kollbjørg is later listed as bound for Providence in Convoy ON 42*, which originated in Liverpool on Dec. 1 and dispersed Dec. 14, Kollbjørg arriving Providence on Dec. 22. From there, she proceeded to New Orleans the next day. In Jan.-1942, she was in the Halifax-U.K. Convoy HX 171. This time, Acanthus and Rose were among the escorts for a while. Kollbjørg subsequently returned across the Atlantic with Convoy ON 65*, which left Liverpool on Febr. 8 and dispersed on the 19th. Her destination is given as Corpus Christi; going back to the archive document mentioned above, we see that she arrived St. Rose, via New Orleans, on March 5. There's a Captain Alfred Edvardsen commemorated at the seamen's memorial in Stavern, Norway (link at the bottom of this page). According to "Våre falne", a series of 4 books naming Norwegians who died in WW II, he died in an accident in the North Atlantic on Febr. 20-1942 when Kollbjørg was on a voyage in convoy from London to New Orleans, in other words, on this voyage with ON 65. From St. Rose, she proceeded to Halifax on March 15, remaining there for quite a long time - again, see Page 2. At the beginning of May that year, we find her in station 73 of Convoy HX 188, returning at the end of that month with Convoy ON 99 (Vice Commodore in Emma Bakke). The archive document gives her destination as Galveston, and she arrived there, via New York and Hampton Roads, on June 29, remaining until July 23. On Aug. 23-1942, she joined Convoy HX 204 from Halifax, arriving her destination Stanlow on Sept. 5 (see Page 3), and about a week later, she's listed as bound for New York in Convoy ON 129*, departing Liverpool Sept. 11, arriving New York Sept. 25. She now made a voyage to Curacao and back to New York, with arrival Oct. 24, and was scheduled to return to the U.K. in Convoy HX 213 on Oct. 26, but did not sail. She was also cancelled from HX 214 and HX 215, but eventually got away with HX 216 on Nov. 19, bound for Bowling and Ardrossan with a cargo of gasoline in station 63 of the convoy, arriving Bowling on Dec. 5, Ardrossan Dec. 7. She was subsequently scheduled to head back to New York with Convoy ON 153 later that month (Bello was sunk - follow link for details), but instead joined ON 155 about a week later. She joined from Clyde and arrived New York on Jan. 6-1943 (the Commodore's narrative is also available for ON 155 - Kollbjørg is mentioned several times). Eglantine and Acanthus are named among the escorts. As mentioned, Kollbjørg had arrived New York on Jan. 6-1943 in Convoy ON 155. By Jan. 14, she was ready to return to Mersey in Convoy HX 223, together with several other Norwegian ships, among them M/T Nortind, and this was to be their last voyage. The weather in the North Atlantic in the winter of 1942/43 was the worst in the memory of man; during a period of 20 weeks storm after storm raged for 116 days, making it difficult for the convoys to stay together, and for the escorts to protect them. This convoy encountered a bad storm which on the 24th approached hurricane force, and when an enormous breaker swept across the foredeck of Kollbjørg shortly after 1 o'clock that afternoon she broke in two behind midships (near the pump room and tank No. 5), 58 28N 41 34W. The two parts drifted away from each other, the engine was stopped by the 4th engineer, and the crew in the stern section chose to stay on board, which appeared safer than the prospects of being in lifeboats in that weather. They saw some of the crew members on the forepart of the ship, which was still afloat with the bow high up in the air, and about half an hour after the ship had broken in two they had to start the engines again in order to avoid a collision with the helplessly drifting foreship. Nortind and the American tanker Pan Maryland went out of the convoy and stayed close to the broken ship all day, but couldn't do much in the storm, and by that evening the forepart was nowhere to be seen. Just after 22:00 those on the stern section of Kollbjørg decided to attempt to leave the ship, and managed to row in 2 lifeboats over to Pan Maryland which succeeded in taking the 26 survivors on board. However, one man was badly injured during the transfer and in spite of continuous efforts to revive him for 3 hours he died that night (Adolf Andersen). By the time they abandoned ship, the front part of the stern section had sunk down so that the propeller was out of the water. Pan Maryland searched for the forepart, but then continued on to try to catch up with the convoy. She landed the survivors in Avonmouth in the afternoon of Febr. 3-1943. The maritime hearings were held in Cardiff on Febr. 9 with the 1st engineer, the 4th engineer, and the carpenter appearing. Carpenter Bækkevold had been on board since Aug.-1940. Nortind, which had a cargo of gasoline was last seen at 01:00 on Jan. 25. She was too far behind the convoy to be able to catch up, and on the 26th she was sunk by U-358 (Manke), approximate position 58 30N 34 00W. All 43 died, 34 were Norwegian, 7 British, 2 Dutch passengers. Their names can be found on my page about Nortind. According to German records Kollbjørg's forepart was sunk by U-607 (Mengersen) and U-594 (Mumm) in the afternoon of Jan. 26, position 58 20N 39 30W, but this was possibly/probably the abandoned stern section (R. W. Jordan's "The World's Merchant Fleets 1939" says she broke in 2 on Jan. 26 and was torpedoed and sunk by U-607 in position 58 40N 33 10W). The Norwegian Brimanger, Brasil, Egda, Villanger and Norfalk were also in this convoy. More information on them can be found with the help of the alphabet index at the end of this page. Martin Sletta had also served on Gunda. Stavern Memorial commemorations - As can be seen, 13 are commemorated here - 2 captains are named, namely Edvin Apall-Olsen and Alfred Edvardsen. "Våre falne", a series of 4 books naming Norwegians who died in WW II, says he died in an accident in the North Atlantic on Febr. 20-1942 when Kollbjørg was on a voyage in convoy from London to New Orleans (he had also served as captain on Eidanger). Going back to the Voyage Record above, we see that Kollbjørg was in Convoy ON 65 on that date - see also Page 2. In addition to those included in the table above, the site also commemorates an Able Seaman Erling Andresen - again, checking with "Våre falne", I find that he was, in fact, on Nortind and died when that ship was sunk while standing by Kollbjørg. He's included in my crew list for Nortind (though his name is spelt a little differently). There's also an Ordinary Seaman Albert M. Kolltveit who might be idential to Albert Mikalsen above (his full name may have been Albert Mikalsen Kolltveit). Merchant Men at War - The British Radio Operator Eric Bissmire has been wondering about the identity of this ship for years, as he caught Kollbjørg's SOS signals (he was on another ship in the convoy at the time - see also this external webpage about him), but did not know what later happened to her until I was able to supply him with this information a few years ago. He now has a separate page on Convoy HX 223, and is aiming to gather personal information from those who took part, so if anyone can help with this, please contact him. He also has pictures of British medals, and an account of the Battle of the Atlantic. Back to Kollbjørg on the "Ships starting with K" page. 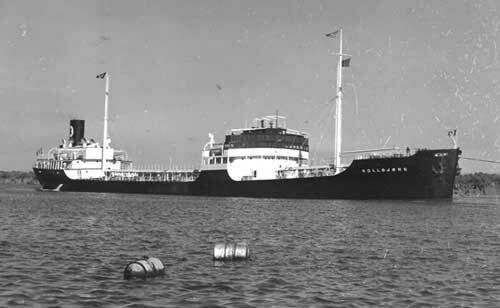 Odd Berg, Oslo later had another tanker by the name Kollbjørg. This was the ex Empire Diamond, built 1941, which became Nortraship's Norsol the following year. Renamed Kollbjørg in 1946. Became the Swedish Storö in 1956 (Odmark & Andersson). Arrived Hong Kong for breaking up on Nov. 20-1959. The text on this page was compiled with the help of: "Nortraships flåte", J. R. Hegland, "Sjøforklaringer fra 2. verdenskrig", Norwegian Maritime Museum, Volume I, and misc. for cross checking facts (ref. My sources).